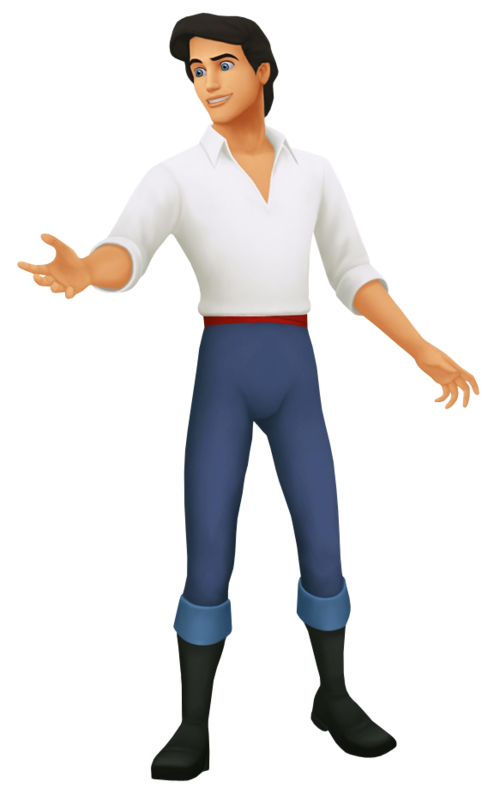 A handsome prince of the surface world, Prince Eric was saved from death by Ariel, but has no recollection of his savior save for her beautiful singing voice. He vows to marry the girl who saved him, but his search is to no avail. When a mute Ariel turns up unexpectedly in his life, he begins to fall for her and comes very close to giving her the kiss of true love. On Ariel's third day however, he becomes mystically entranced by Vanessa, a woman with a beautiful singing voice who also happens to be Ursula in disguise. Sora shatters Ursula's locket, freeing Eric from her spell. Thankfully, Eric's love for Ariel is not restricted by the sea. He plays an active role in the battle against Ursula, eventually dealing the fatal blow by hurling the Trident through her heart. Though he is shocked that Ariel is a mermaid, he takes it in his stride and accepts Ariel for who she is.